I had an epiphany this morning while using the elliptical at the gym, which is where many of my sudden realizations take place for some odd reason. I used to have two parakeets, Tikko and Tweety. Having recently gone through a divorce, I see some parallels with their relationship and my failed marriage. Tikko was a very small female parakeet who was extremely feisty. 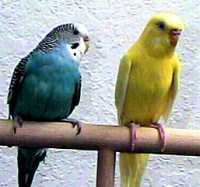 I had Tikko for several months before adopting Tweety, a lutino (yellow) male parakeet. Although it’s hard to tell from the picture, Tweety was considerably larger than Tikko. The two bonded after a few days in the same cage together. Tikko and Tweety spent about 8 years together. Tweety would regurgitate his food and feed Tikko, which is something birds do to demonstrate affection. They also spent a lot of time by each other’s side. However, Tikko had a bit of a vicious streak. Several times a day, she would go after Tweety in a not so nice way. Tikko, the cute little psittacine, was a terrorist. Female birds tend to be the aggressor in a bonded pair, hence the term “hen pecked”. As dysfunctional as Tikko and Tweety’s relationship was, I felt that they were very happy together. Tweety, despite the spousal abuse from Tikko, was a dedicated partner. I feared that if Tikko were to pass on first, Tweety would become despondent and follow soon afterwards. One morning when their cage was uncovered, Tikko was lying on the bottom of the cage. At some point during the night, she had expired. I was expecting Tweety to be depressed. Much to my surprise, he seemed invigorated. Tweety was much more active and loquacious than normal. I finally understood. After 8 years of abuse, Tweety was finally free from his tormentor. Tweety lived for about another year. There wasn’t a day that went by that he did not sing for extended periods. For Tweety, being alone was better than being trapped in a cage with an abusive partner. It is now my turn to sing. Oooo that’s good…. I can relate.